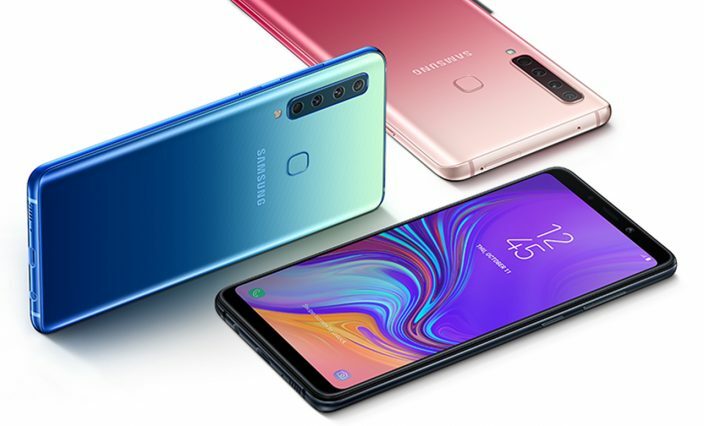 Samsung has just taken the wraps off its latest mid-range smartphone -- the Galaxy A9 -- and it’s one that the South Korean tech giant says has been made with "Instagram generation" firmly in mind. The key difference between this, and other similarly priced devices is it comes with the world's first quad camera. This might seem like a gimmick, and to a degree it probably is, but actually each of the four lenses servers a different, useful purpose. The 'main' lens is a 24-megapixel shooter, and then there’s a 5-megapixel depth lens, which lets you play around with the depth of field and focus on the subject (bokeh) and an 8-megapixel ultra wide lens with a 120-degree field and Scene Optimizer that uses AI Scene Recognition to identify the subject and adjust settings accordingly. Finally there’s a 10-megapixel telephoto lens with a 2x optical zoom, and a 24-megapixel front-facing camera for the obligatory selfies. Beyond the cameras, the A9 is a decent phone. It has a bright 6.3-inch display, and is powered by an octa-core Snapdragon 660 processor. It comes with 6GB of RAM and 128GB of storage, and up to 512GB of expandable memory via microSD. The 3,800mAh battery is better than found on most similar devices. Connectivity Wi-Fi 802.11 a/b/g/n/ac (2.4/5GHz), VHT80 MIMO, Bluetooth® v 5.0 (LE up to 2Mbps), ANT+, USB Type-C, NFC, Location (GPS, Galileo*, Glonass, BeiDou*)*Galileo and BeiDou coverage may be limited. "As a global leader in smartphone innovation, we understand the demand for meaningful innovation in a fast-paced world driven by visual communication," said DJ Koh, President and CEO of IT & Mobile Communications Division at Samsung Electronics. "Building on our legacy in smartphone camera development we’re introducing next-generation technology across our entire Galaxy portfolio to give more consumers the opportunity to experience cutting-edge innovation. We’re excited to deliver on this promise and debut world leading smartphone camera technology with the Galaxy A9." The Galaxy A9 is available in Caviar Black, Lemonade Blue and Bubblegum Pink. It will be priced at £549 ($725) when it launches in the UK in November. No word on US release plans yet.